For up-to-date weather updates for the 2019 Bearathon, visit the Weather Update page. The Bearathon is on March 23, 2019! Registration is open and can be found on Active.com. The Bearathon is a challenging half marathon that has earned itself the nickname as “The Toughest Half in Texas.” The Bearathon serves as one of Student Foundation's largest and most effective fundraising efforts each spring to raise money for Student Foundation scholarships. The race is open to the public and attracts about 2,000 runners from across the state of Texas and across the nation resulting in over $25,000 for student scholarships. Other features of the course include a tour of campus with a run by the newly built Rosenbalm Fountain, a brief venture into Downtown Waco, through the challenging hills of Cameron Park, and will finish alongside the great Brazos River. The Sic 'Em 6K run starts and ends at the same location as the Bearathon and will take runners on a scenic tour of Baylor University's campus. Be sure to follow us on social media (Instagram, Twitter, and Facebook) for the latest updates on the Bearathon! Check out the 2019 Official Race Day Guide by clicking the image below. The Bearathon has been voted "Best Running Event" by readers of the Wacoan for the fourth straight year! Thank you, Waco neighbors, for your support and encouragement! 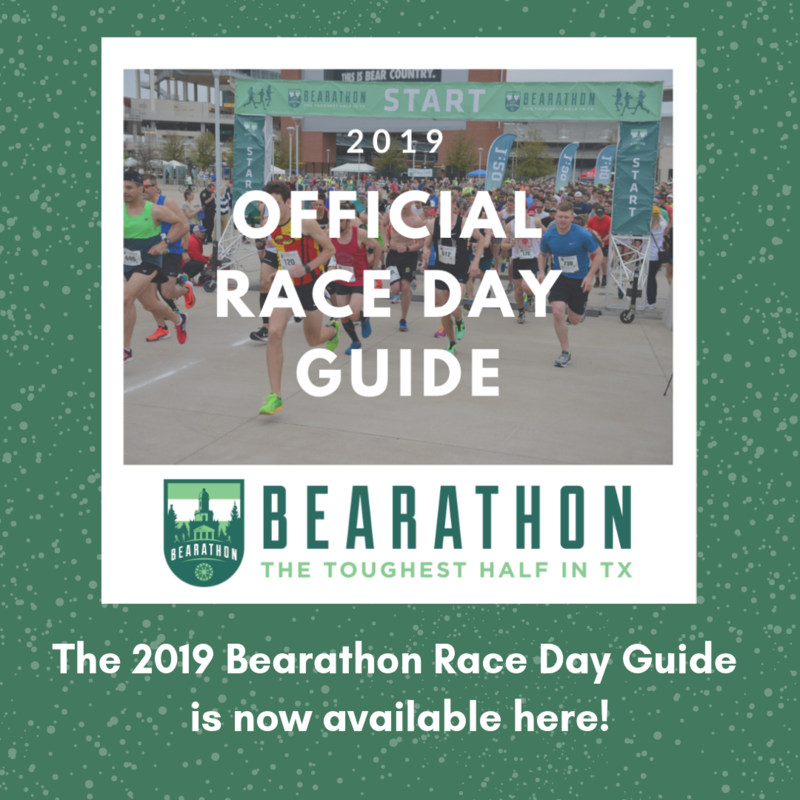 You may find all the information you need about the 2019 Bearathon through our website, including the registration rates, course maps, race policies, and other helpful information.